Brazilian design duo Humberto and Fernando Campana have created a collection of furniture consisting of an armchair and three cabinets made almost entirely from cork. Named Sobreiro Collection, the pieces were created to show off the potential of cork as a design material – that can be versatile, attractive and sustainable. Known for their use of natural and raw materials, this is the first time the Campana brothers have worked with cork. In the past they have used leather, palm fronds and even fish skin to create unusual effects in their work. 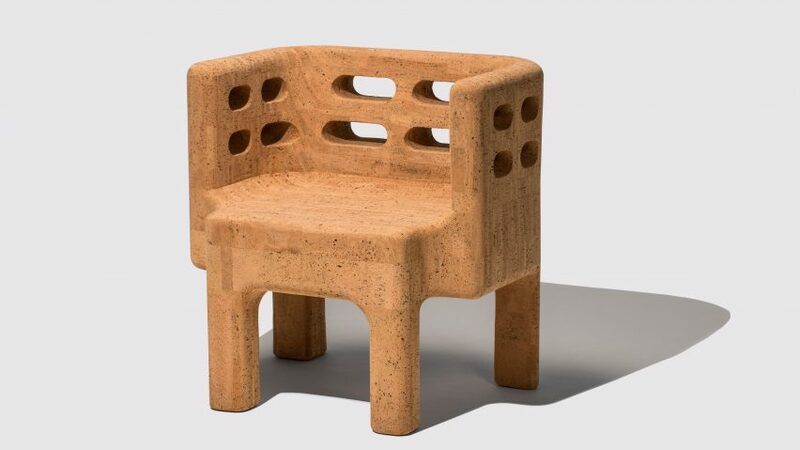 "We've always been fascinated by cork, not only because it is an ecological material but because of its lightness," explained Humberto Campana. "The texture, variety of applications and insulation properties enrich the possibilities of using this material, in order to express new concepts and gestures. It's like marble that can be sculpted." The sustainability of the material was also very appealing to the designers. Cork is one of the most sustainable materials to harvest and is completely recyclable. "We're keen on exploring recycled materials. We have been discovering so many impressive sustainable and ecological materials and processes," Campana continued. "At the moment, we are researching the possibilities of use of the pineapple leather." The single arm chair and three cabinets come in different shades of natural browns. One cabinet features a wave-like texture, while another has a stippled texture reminiscent of pebbles. The armchair is made from natural cork alone, while the cabinets are composed of a wooden structure made from expanded natural cork agglomerate, a material made by heating the cork and does not contain any additive. One of the three cabinets is made from a combination of the cork agglomerate and natural clay – an experiment into hybridity of the materials. "The cabinet made of cork and clay was an experiment," said Humberto. "I immediately got inspired by the hybridism between these materials and I saw a possibility to design a piece for the Sobreiro collection. We are very much into hybridism." The Sobriero Collection was revealed at the Consulate of Portugal in São Paulo, Brazil during the annual Experimenta Portugal arts and culture festival. The festival celebrates the cultural connections between Brazil and Portugal. Research for the cork furniture was conducted in Portugal in collaboration with the Portuguese cork association (APCOR) and a major Portuguese cork supplier, Amorim. Humberto Campana spent time in Amorim's laboratory experimenting with the materials. Cork is one of Portugal's main export materials. Founded in 1983 in São Paulo, Campana Studio has become renowned for its creative design and furniture. In 2016 the Campana brothers built a house in São Paulo, Brazil that is covered in palm fibre to give it a hairy exterior. They've also created furniture from fish skin leather and a bed hidden behind a curtain of raffia.